Peruvian Opal in pastel blue, green and pink. Peruvian opal in pastel colors of blue, green and pink. 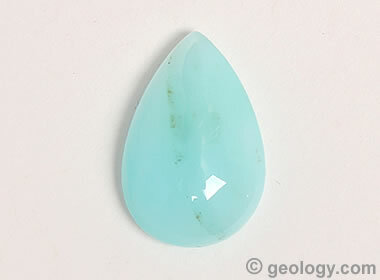 Blue Peruvian Opal: A beautiful blue cabochon cut from common opal mined in Peru. The South American country of Peru is the source of some of the world's most beautiful opals. 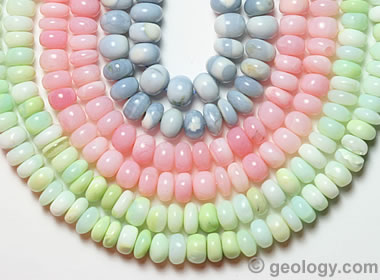 Peruvian opal is found in wonderful pastel blues, greens and pinks. These are common opals that lack the "play-of-color" of precious opal - but the color of this material is anything but "common". It is seen in the market as beads, cabochons, and tumbled stones. Peruvian Opal Beads: These strands of beads nicely represent the colors of Peruvian opal. They are mainly an opaque to translucent common opal. However, if you hold them up to a bright light, small play-of-color zones can be seen in some beads. The beads are smooth rondelles, about 7 millimeters in diameter. We are surprised that Peruvian opal is not more expensive. We purchased the 16-inch strands of beads shown in the accompanying photo in late 2015 for about $40 per strand. We were previously familiar with the pink and the blue colors but doubted that the green was natural. We sent one of the darker green beads to GIA for identification. They identified it as yellowish green natural opal. You can see the report here. Some Peruvian opal sells for much higher prices. These are gemmy, semitranslucent cabochons and faceted stones with a spectacular greenish blue to blue color. They often sell for ten to twenty dollars per carat.